Thinking about that lyric recently, I was surprised to realize that there are very few Westerns of the ’40s or ’50s which feature Christmas as a significant part of the story. I was initially inspired to search and see if there’s a Christmas-themed Hopalong Cassidy film, but so far have only found a 1952 episode of the Hopalong Cassidy radio show titled “The Santa Claus Rustlers.” It’s readily available online. Looking beyond Hoppy, the best-known example of Christmas in a Western is probably John Ford‘s 3 Godfathers (1948), in which John Wayne‘s character arrives successfully and delivers a baby boy rescued in the desert to a frontier town on Christmas Day. This Columbia Pictures film starring Autry is refreshingly different from many movies of the era, presenting a story which is enormously sympathetic to Indians. 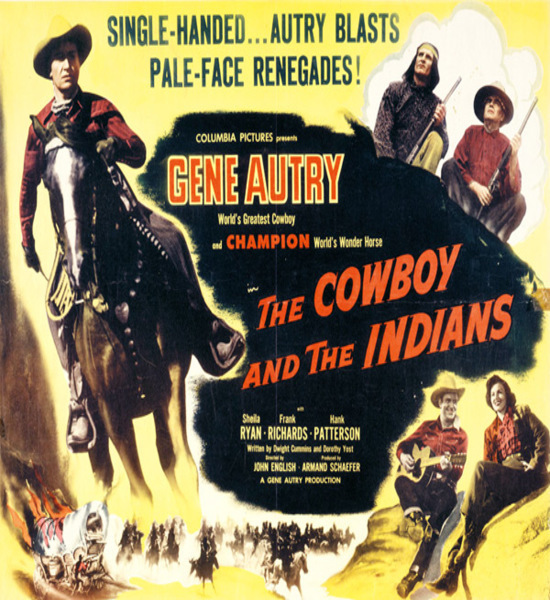 It’s worth noting that this film preceded by a year Universal’s better-known Broken Arrow (1950), which also presented a fresh viewpoint on Indians, a change of pace from their longtime use as stock villains in Westerns. The film begins with the narrator explaining the historic battles of Indians vs. Western settlers from the Indian point of view, as defenders of their homeland. From there we arrive in modern day and meet Gene Autry (playing…Gene Autry! ), who is plainly annoyed to discover Indians grazing their sheep on his newly acquired ranch land. He grumbles “Why don’t they stay on the reservation where they belong?” and then heads off to see the chief, entering his home without so much as a knock. Gene’s irritation quickly changes when he sees an elderly Indian woman in the home is very ill, and he helps arrange her medical care with Nan (Sheila Ryan), the local doctor. Gene is shocked when he learns the woman is suffering from malnutrition, as are many others in the tribe. Gene tries to interest a local newspaperman in the Indians’ plight, only to be told it’s not newsworthy: “Interest in the noble red man died with Geronimo.” But Gene is determined not to quit and contacts a friend (Roy Gordon) in Washington. 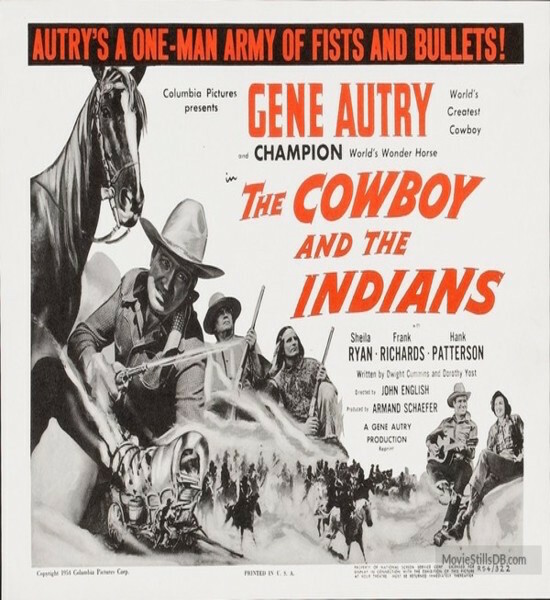 Meanwhile Gene and the tribe contend with an unscrupulous trading post owner (Frank Richards) who cheats the Indians and conspires with others to steal from the tribe. Attempting to see justice done, Gene works closely with Lakoma (Jay Silverheels), an Iwo Jima veteran who will one day be chief. Silverheels portrays Lakoma as a smart, educated man who speaks perfect English, unlike his famous Tonto character from the Lone Ranger TV series. In a twist Western fans are sure to love, one of the bad guys in The Cowboy and the Indians is played by Clayton Moore, Silverheels’ Lone Ranger costar; seeing Silverheels and Moore shooting at each other in the climactic gunfight is quite fun. It’s a rather remarkable coincidence that the first episode of The Lone Ranger aired the exact same date that The Cowboy and the Indians was released, September 15, 1949. There’s some fun irony that when the “cavalry” shows up to save the day near the end…and it’s the Indians! If all this doesn’t sound very Christmas-y, that’s true! There’s no sign of Christmas in this film until the finale, but those scenes are such heartwarming examples of seasonal cheer that they’re worth the wait. After successfully lobbying Congress for help, Gene turns up at the reservation with trucks of supplies labeled “Gifts from America to the First Americans.” Gene rides horseback ahead of the trucks singing his great 1947 hit “Here Comes Santa Claus.” His foreman (Hank Patterson) rides alongside him, dressed as Santa. From there we move to the final scene, as the Indian schoolchildren sing a beautiful rendition of “Silent Night.” As the final notes fade out, the movie ends with a shot of a star atop a Christmas tree. The Cowboy and the Indians is a strong Autry film which is interesting on multiple levels and has good supporting performances from Ryan and Silverheels. The Christmas scenes are the icing on the proverbial cake. Forget the title, which strangely has nothing whatsoever to do with the film, and just enjoy this fun movie from Republic Pictures. Roy Rogers plays a U.S. Soil Conservation Service agent named…Roy Rogers, of course! 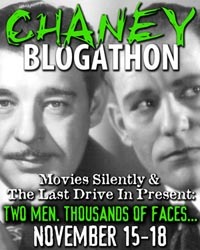 Roy is friends with a retired movie star named Jack Holt, played by…Jack Holt. I find it amusing how frequently characters in these “B” Westerns go by their real names. Jack’s business plan doesn’t sit well with businessman J.C. Aldridge (Emory Parnell), who’s out to corner the market on Christmas trees. He sends his daughter Toby (Penny Edwards) to try to close a deal to buy Jack’s land, but he’s not selling. Unbeknownst to the Aldridges, J.C.’s employee Mitch McCall (Clifton Young) is going to great…great criminal lengths to ensure that his boss can put Jack out of business. However, Mitch hasn’t counted on the determination of Roy or Jack’s friends. This charming, somewhat goofy little film takes place in what I like to call “Roy Rogers Land,” where there are modern conveniences such as cars and telephones, yet the gun-toting cowboys are much more likely to travel by horse or wagon than a gasoline-powered vehicle! 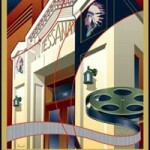 The use of Trucolor, with its washed-out pastels, adds to the movie’s somewhat otherworldly, “place out of time” atmosphere. 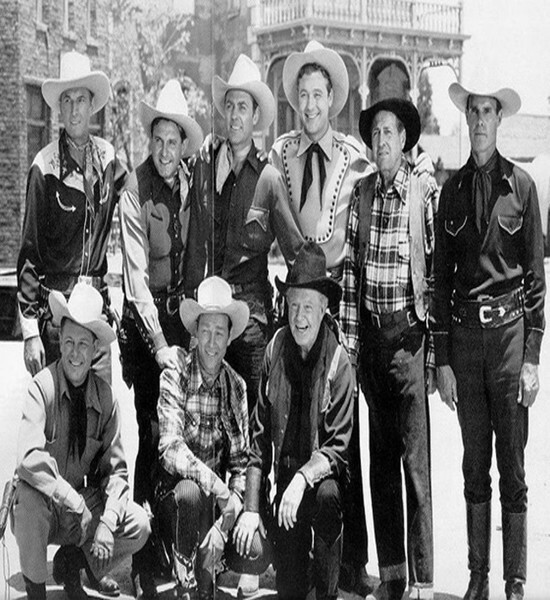 Adding hugely to the fun are the appearances of several Western stars who arrive to help Roy and Jack, including Tom Keene, Crash Corrigan, Allan “Rocky” Lane, Rex Allen, Monte Hale, Kermit Maynard, and Tom Tyler. These scenes will put a smile on the face of anyone who loves “B” Westerns. 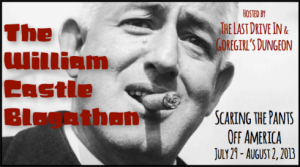 Comic relief is also supplied by Gordon Jones as “Splinters,” with Carol Nugent playing Sis, his younger but wiser sister. Sis has a pet turkey named Sir Galahad, who might (or might not) be in danger of being eaten for Christmas dinner. This film’s music and sunny good nature will definitely help put viewers in the Christmas spirit. 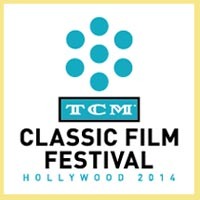 Both The Cowboy and the Indians and Trail of Robin Hood are available from varied sources, and Trail of Robin Hood is on the Turner Classic Movies December schedule this year as well. 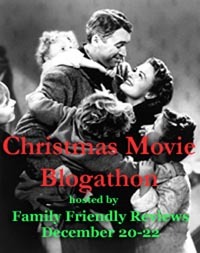 I’d love to learn about any other Westerns featuring Christmas in the comments! 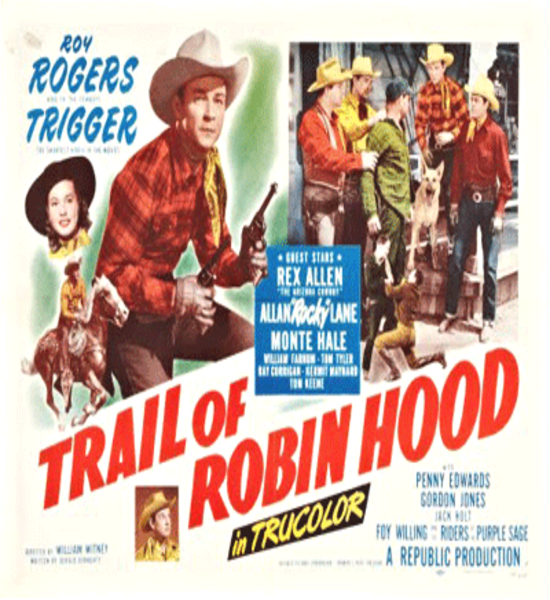 This entry was posted in Posts by Laura Grieve, Western RoundUp and tagged Gene Autry, Roy Rogers, The Cowboy and the Indians 1949, Trail of Robin Hood 1950. Bookmark the permalink. 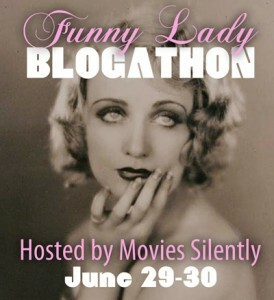 Another fascinating entry Laura G. I have a fond memory of a TV movie, from 1969, Silent Night, Lonely Night. A Christmas time setting, with Lloyd Bridges and Shirley Jones. On a personal note, I love Gene Autry. Singer, songwriter, actor, producer, pilot during the war. What child could ask for more. Here is another Christmas western. Stars Tex Ritter. I just ran The Cowboy and the Indians, a sweet film if there ever was one and would no doubt be ‘problematic’ if the Huffington Post had any say, and it probably does. Here Comes Santa Claus Indeed, coupled with God Bless America, worse than Rudolf the Red Nosed Reindeer. Laura, what a delightful Western Movie Christmas write-up. You can’t get any better than Gene Autry and Roy Rogers for Christmas in the West. 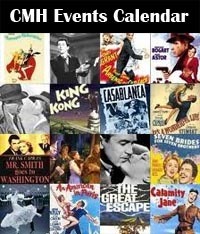 You are right about the slim Christmas pickings in Western Movies during the 1940’s and ’50’s. Although, there is CHRISTMAS MOUNTAIN a traditional made Western from 1981, that is Christmas themed. Slim Pickens portrays Murf, a Heavenly cowboy angel, or angel wannabe. He comes riding down from Heaven to help and old friend Gabe Sweet(Mark Miller, from the 1965-67 PLEASE DON’T EAT THE DAISIES TV show). Slim is dressed in white, including the horse. I saw this movie one time back in the early 1980’s. Believe it, or not CHRISTMAS MOUNTAIN was thought to be a lost movie for 20 years. Apparently it was found and remastered, and released on DVD. Looking forward to your next wonderful write-up. What a delightful Christmas treat, Laura! Believe it or not, but I have never (yet) seen “THE COWBOY AND THE INDIANS”. This needs to be remedied…..
Of course, “TRAIL OF ROBIN HOOD” is a delight. 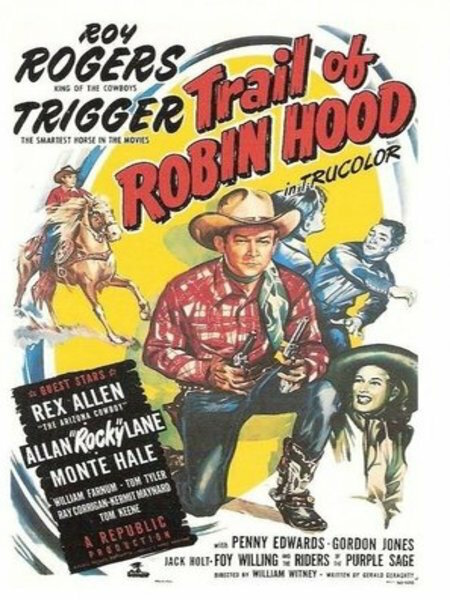 I particularly enjoyed Jack Holt in the film, as well as seeing favourites, “Rocky” Lane, Monte Hale and Rex Allen in Trucolor. And there is a delightful line in the movie from long-time villain, George Cheseboro. I am sure you know the line I mean. Although not a western, I have just watched a Christmas-based movie starring western old-timer, Harry Carey, along with a very young Richard Carlson as a Texas cowboy loose in New York. 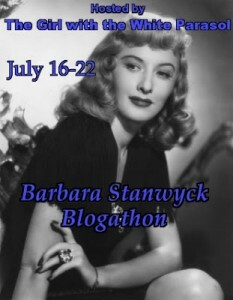 The movie is “BEYOND TOMORROW” (1940) and quite recommendable. Robert Blake, thank you for your kind words. I have heard of that Bridges-Jones movie but never seen it, will have to look for it. I have been fortunate to see Shirley in person on a couple occasions. Barry Lane, I think I’ve mentioned before that I used to look for Mr. Autry’s car in its parking place at the Big A here in Anaheim! He had so many varied accomplishments. I’m really delighted you liked the movie. Larry Hopper, thank you for adding another Western to my list, that’s great! I’ll be looking for it. 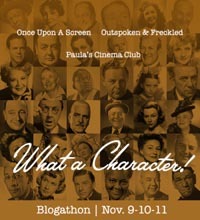 Isn’t it fun to see all those Western stars in the movie? Walter, I appreciate your feedback! I’m not familiar with CHRISTMAS MOUNTAIN and am also putting it on my list — how interesting that a relatively recent film was lost. I’m glad they found it! Jerry, thank you!! I hope you can see THE COWBOY AND THE INDIANS soon. I hope you’ll enjoy it as much as I did! It was great fun to go back to TRAIL OF ROBIN HOOD recently for the first time in a few years, I feel I appreciated it even more than I did the first time, having become more familiar with many in the cast in the intervening time. I’ve also seen BEYOND TOMORROW — wonderful cast! I loved much about the movie although I found the plot turn late in the film distressing. Here in the U.S. 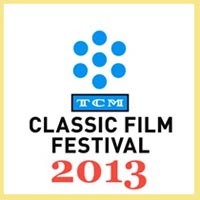 BEYOND TOMORROW was shown on Turner Classic Movies last night, and it will be re-shown on Christmas Eve. 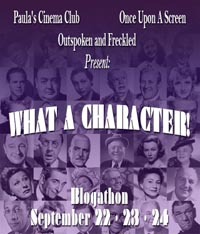 It’s a great opportunity to see Harry Carey Sr., who makes every movie better, Western or otherwise! I’m (overly) familiar with Trail of Robin Hood, but The Cowboy and the Indians is new to me and I’m so happy to add it to my seasonal viewing. Remember the TV special Stubby Pringle’s Christmas from 1978? A charming Christmas Special from Hallmark starring Beau Bridges as a cowboy lonely cowboy. I don’t remember that TV-movie — another one for my list! I love this article! Earlier this year I saw the noir film Lady in the Lake (1947) – which takes place around Christmas – and thought, “It would be cool to do an alternative Christmas film marathon.” Sounds like The Cowboys and the Indians & Trail of Robin Hood would fit that bill. 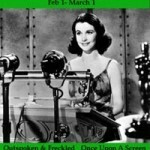 Will see if I haven’t already missed Trail of Robin Hood and will set the DVR to record it. Post-Note: Kinda bummed “Get a Christmas Tree for Johnny” and the lovely “Ev’ry Day is Christmas Day in the West” weren’t on Spotify. I would have liked to added those tracks to my Christmas Music playlist. Thanks for your note, Chris! I hope you’ll be able to catch these films — they make a nice change of pace from the beloved yet oft-seen Christmas classics. 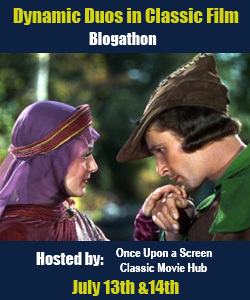 TRAIL OF ROBIN HOOD is on TCM on the evening of December 15th so I hope you can DVR it. Thank you so much, Daniel, I’m delighted to know this article “hit the spot” for you and gave you some viewing ideas. I hope you’ll enjoy the movies. Merry Christmas! The Three Godfathers was an amazing movie with perfect anti-heroes. I was never a huge Roy Rogers fan, but I adore Gene Autry. His version of Rudolph the Red-Nosed Reindeer is pefect! The only one I heard about is Three Godfathers. I never thought I would ever here how well Christmas and Western came together. I’m catching up on comments a bit belatedly after the pre-Christmas rush! 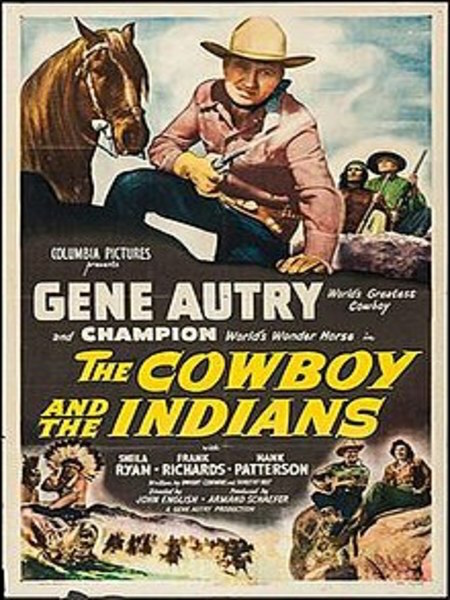 Sara, if you like Gene Autry I think you’d like THE COWBOY AND THE INDIANS! Hope you can see it. David, I hope you can try these movies as well. Also wanted to mention that a correspondent mentioned there are Christmas scenes in a little movie I really enjoy, DESERT PURSUIT (1952) with Wayne Morris and Virginia Grey. I completely forgot about that one! The only movie I’ve seen, of the ones you wrote about, was the Three Godfathers. I’m glad there are some westerns with a Christmas type theme I have to look forward to viewing! I hope you’ll be able to watch them, Laurie! Glad I could make you aware of them. Happy viewing!